On a cool weekend morning, I love to pull together a batch of warm savoury scones and enjoy them with a cup or two of my favourite tea. 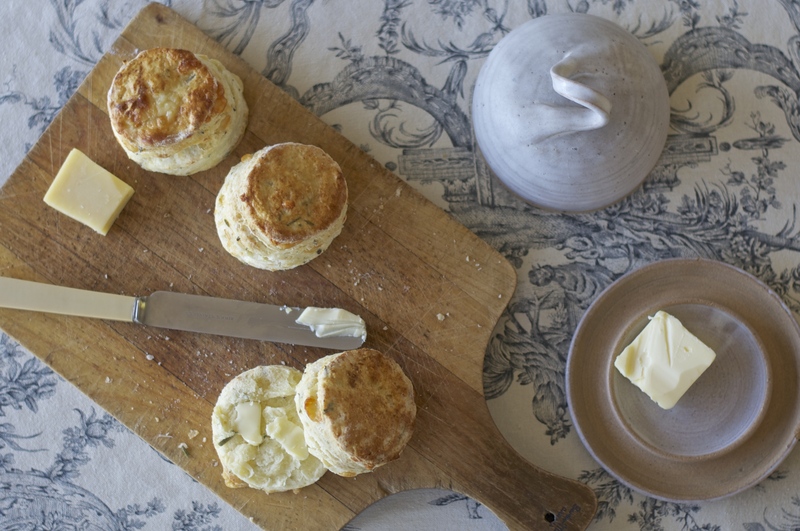 There are different types of scones: these are based on a buttermilk biscuit recipe that results in a light scone that has many tender layers. They are quick to make and quick to eat. Today I had some leftover gruyere which I used. An old cheddar also makes a delicious scone. I prefer to be able to “find” the cheese in my scones so I slice it thinly and then chop it into small pieces – each piece is roughly 1/2 x 1/4 x 1/32 inch in size. 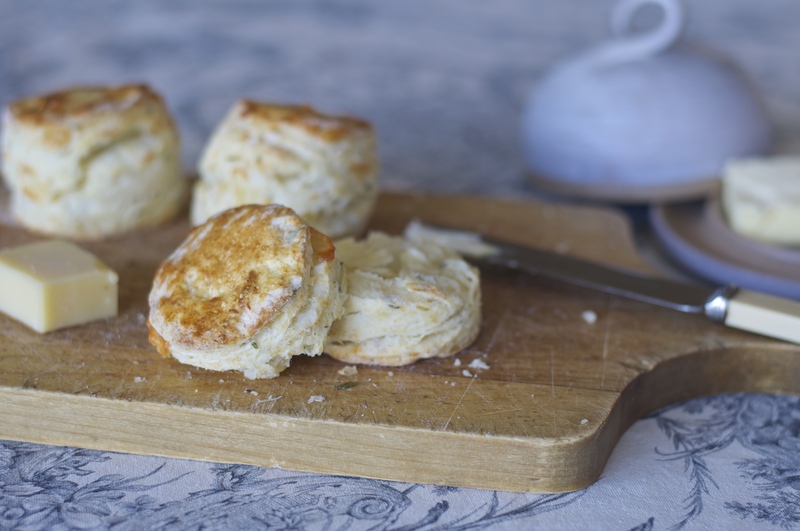 Grated cheese disperses more consistently throughout the scone but is a little quicker to prepare if you are pressed for time. It is a matter of choice. If you are not a huge rosemary fan, thyme or an herbes de provence mix also work well. These scones don’t need to be buttered, but a little extra butter doesn’t hurt them one bit. They are also nice with jam. 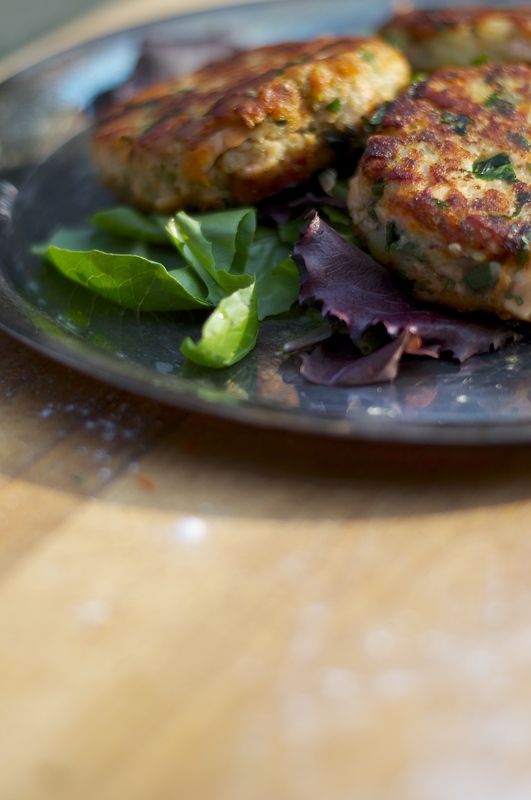 Alternatively, they are delicious with a little cured ham or hard sausage. Today, I enjoyed them with some duck prosciutto and some lamb prosciutto from Oyama Sausage on Granville Island in Vancouver. Combine flour, baking powder, sugar, and salt in a bowl and cut in the flour until it is well blended and the consistency of coarse oatmeal. I recommend using your fingers rubbing the butter and flour mixture into flakes between your thumb and first two fingers. Mix the gruyere, rosemary and pepper into the flour mixture and create a well in the center. In another bowl, combine the buttermilk with the baking soda and egg and beat the mixture. Add the almost all of the liquid mixture to the the flour and butter mixture, reserving a little (about a tablespoon) for a wash (see below). Using a dough scraper, quickly combine the dry and wet ingredients to form what my mom calls a “shaggy mass”. As soon as the dough begins to come together, stop. Flour a surface and dump the contents of the dough bowl onto it. Gather the dough bits into a rectangle, then fold the rectangle into thirds. Flatten the new rectangle gently by pressing on it. Scoop up any loose bits with the dough scraper and toss them onto the new rectangle. Fold in thirds again. Repeat this process just until the former “shaggy mass” forms a soft dough (no more than 6 or 7 turns). Roll out the dough to a 1″ thickness. If you forgot to reserve a little of the liquid for a wash, beat an egg with 1 tbsp of milk and a pinch of salt to create an egg wash or just use a little heavy cream or buttermilk. Using a glass or round cookie cutter, cut the dough into rounds flouring the cutter between each cut to minimize sticking. After cutting as many pieces as possible, gather up the leftover bits, press them together forming a new rectangle, rolling it to an even 1″ thickness and cut some more rounds. The less you can work the dough to accomplish this the better – the scones will get tougher the more the dough is worked. 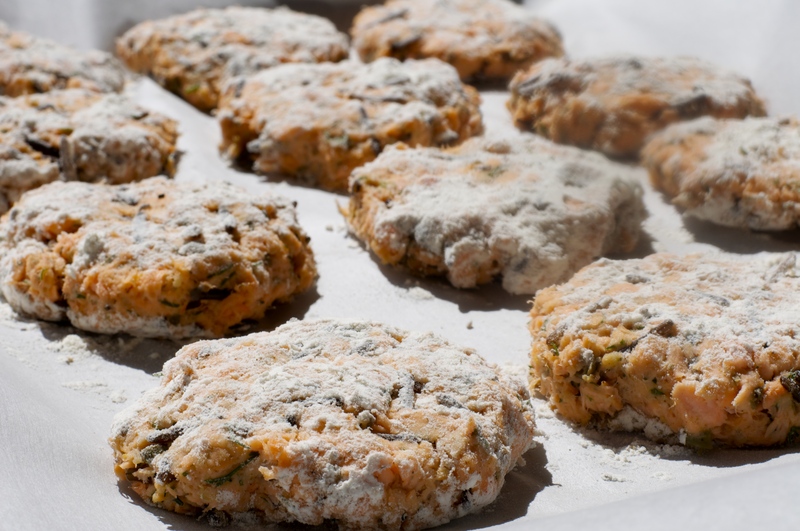 Place the rounds on a baking sheet lined with a silpat or parchment (for easy cleanup) and glaze them with the wash being careful to only put wash on the tops – having wash on the sides will impair the ability of the scone to rise . Bake for about 15 minutes, until they are golden-brown in color. N.B. If you prefer a less savoury scone, you can replace the cheese and herbs with dried cranberries (1/2 c.) and citrus zest (a few teaspoons), currants (1/2 c.), or make them plain. Great news, not only is it summer, but I have finished my undergrad and have 3 months before my first year in law school commences. I’ve got a summer job that I’m quite excited about, who would’ve thought employment would feel like such a luxury!?! 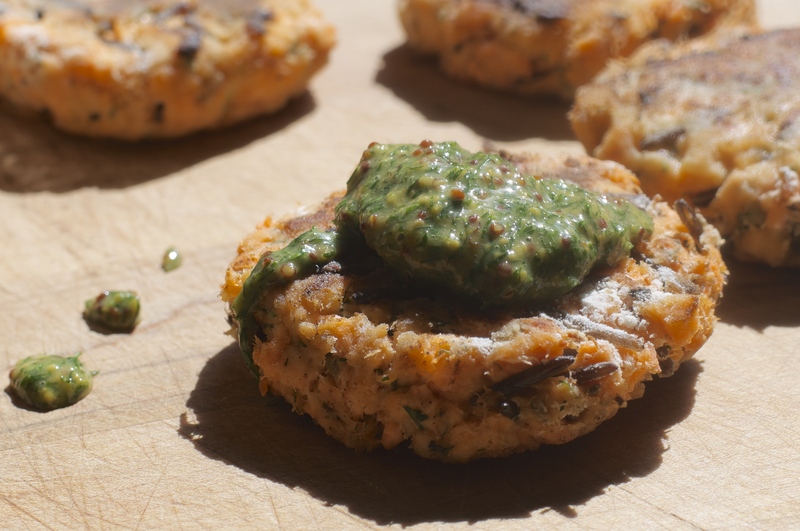 If you are thinking, “hmmm, no blog posts since November, I wonder if she still knows how to cook?” the answer is yes, I just have spent very little time cooking anything shareable. 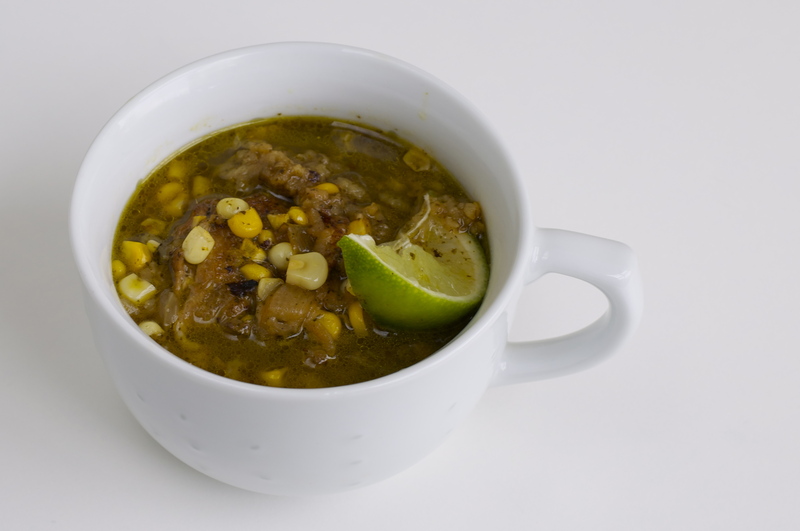 So, although the weather is getting warmer, here in B.C., we still have the occasional wet and chilly day and this is the perfect meal for just that. I inquired as to its origins and my mother scoured her cookbooks and the internet to no avail. So while I am sure this faux-tagine is not a family recipe, I can only credit my mom for introducing it to me. 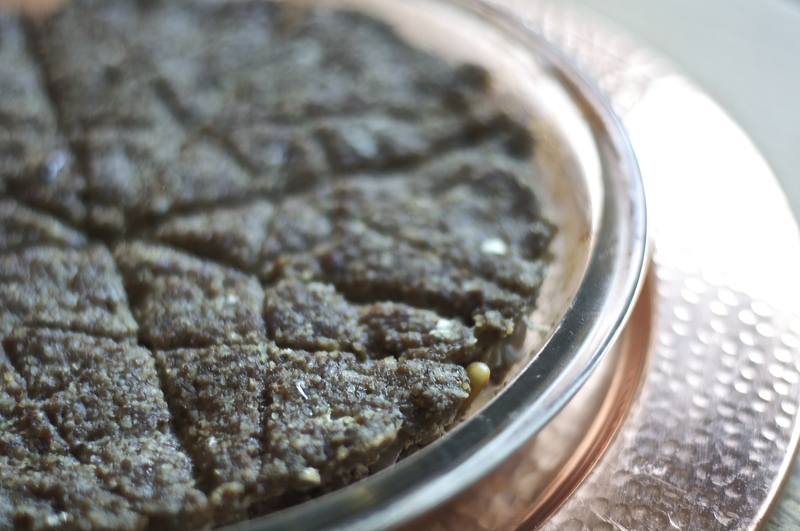 Toast the cumin seeds in a skillet for about 4 minutes, stirring a few times. Grind the cumin seeds and coriander seeds coarsely with a mortar and pestle. Set aside. Preheat oven to 350F. 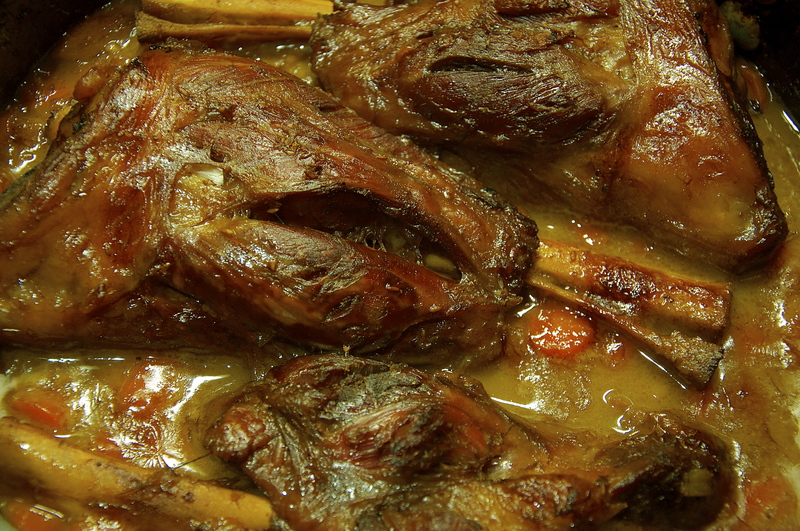 Season the lamb shanks with salt and pepper. Put the olive oil in a large ovenproof pan over medium-high heat. Brown the lamb on all sides, 10-15 minutes. Remove the lamb, pour off the fat and add the carrots and celery. Cook over medium heat for 4-5 minutes or until just beginning to soften. Add the fresh ginger, onion, and saffron and cook until the onion is translucent and soft, about 5 minutes. Add the wine, ground cumin, ground coriander, cinnamon stick, ground ginger, ground cloves, bay leaves, and dried apricots. Cook 5 minutes. Place shanks back in the pan and add the stock. 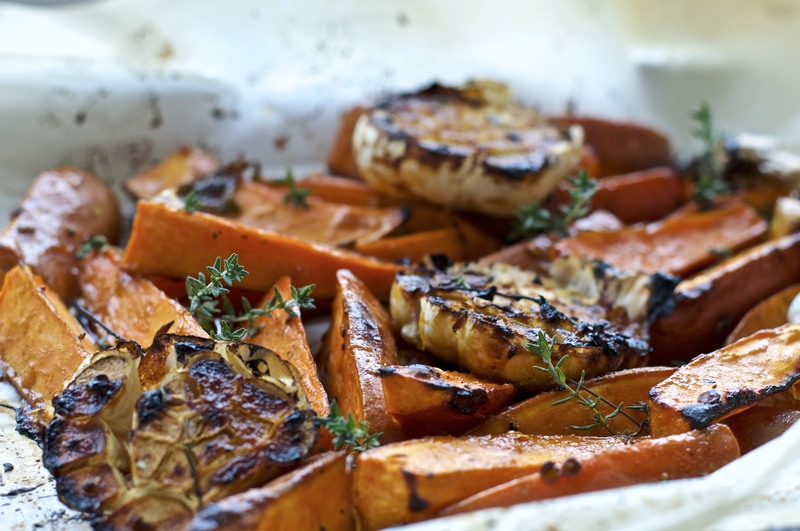 Cover the pan and cook in 350F oven for about 1 ½ hours or until meat is tender and falling off the bone. Remove the lamb shanks and cover with foil. Set aside and keep warm. Skim the fat off and strain liquid into a saucepan. Discard solids. Reduce the braising liquid to a saucy consistency by slowly simmering. Time will vary widely, can take as long as 20 minutes. Adjust the seasoning by adding salt and pepper, add butter. 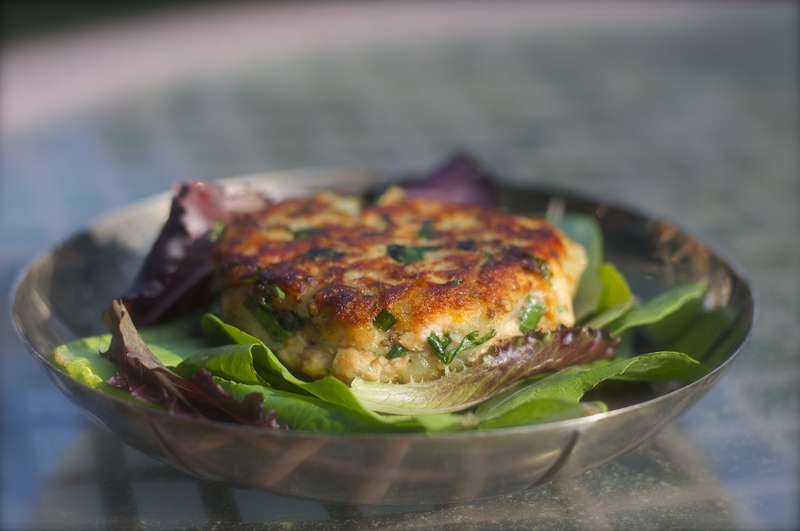 Serve with couscous and a nice seasonal green vegetable. At a visit to the local Saturday market, we were offered a taste of this delicious tart made by Hastings House pastry chef, Rosemary Harbrecht. 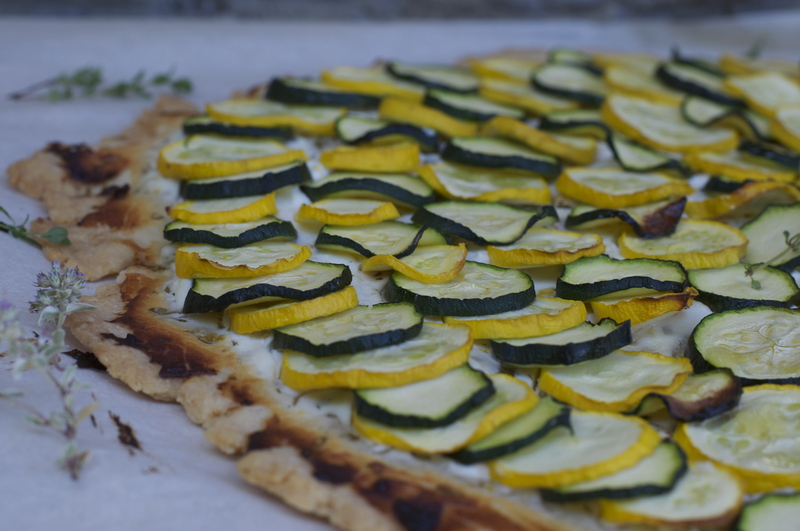 The pastry was a perfect compliment to the freshness of the cheese and zucchini. Rosemary gave us a copy of this recipe and we made it for lunch that day and it was a family hit. Enjoy! By hand or in a food processor, mix flour, butter, 3/4 tsp. salt until crumbly. Add the vinegar and 3-4 tbsp. cold water just until dough comes together. Flatten the dough into a disk and wrap in plastic to chill for 20 minutes. Roll out the dough to about 10 or 11 inches in diameter. It should be about a 1/4 inch thick. Place the pastry on a parchment lined baking sheet and chill for at least another 15 minutes. Toss the zucchini slices with a teaspoon of salt and let it drain for about 20 minutes. Gently press out more moisture with paper towel. Then toss the zucchini in a bowl with pepper and 1 tbsp. of the olive oil. Mix the cheese with the herbs, zest, and salt and pepper to taste. Spread this over the pastry leaving a small uncovered border. Arrange the zucchini slices in overlapping circles. 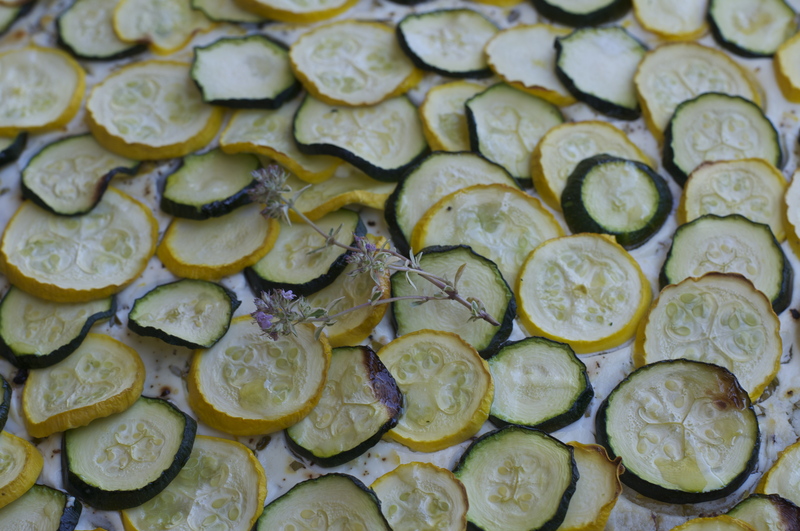 Drizzle with the remaining olive oil and bake for 30-40 minutes until the zucchini is golden around the edges.